Representing the brand’s first Middle Eastern outpost, STK has launched at Rixos Premium Dubai hotel on JBR. Well-established in destinations including the likes of London, New York City, Los Angeles, Las Vegas, Toronto and more, STK is a high-energy restaurant that serves up high-quality steak with a side of party. Combining a restaurant, lounge, hidden terrace, and a large bar area that features an overlooking DJ deck, STK JBR is spacious venue able to seat up to 220 people. Inside, the vibe is upbeat, cool and trendy. Upon entering I instantly feel in the mood for a fun night out, with the DJ playing some of the best music I’ve heard in a restaurant for a long time – a great mix of old and new infectious favourites, that type that gets everyone singing and dancing along. Dimly lit with spotlights highlighting tables and monochrome artwork on the walls, STK has a chic yet industrial feel. 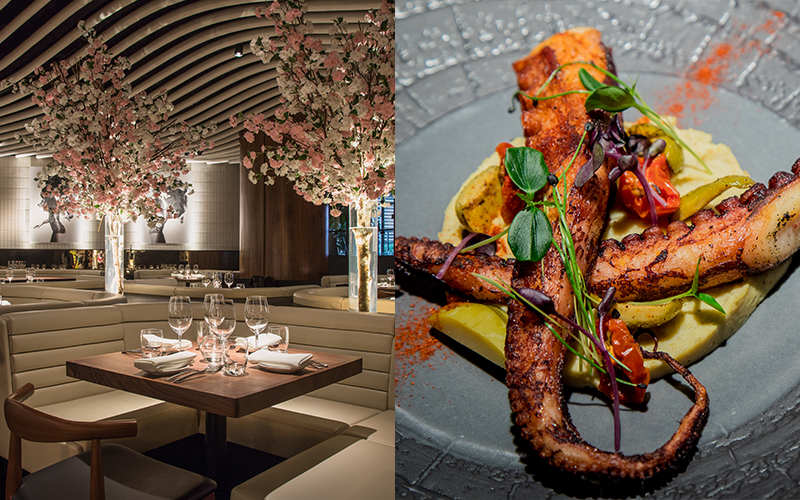 Beautiful pink and white flower displays, white leather booths with soft curves and a light, waved ceiling feature give the restaurant a very feminine feel that’s welcoming and elegant. The menu here highlights classic steakhouse favourites, with a strong American influence. To start, the roasted octopus dish was the winner for me. Seasoned with smoked paprika, the tender, meaty tentacle came served with green olive, and eggplant-chickpea puree, which all blended beautifully and packed a lot of flavour. From the raw bar we also tried the tuna tataki with seaweed salad and shredded celery, dressed with sesame aioli and ginger soy. For mains, steak is the obvious option here, however there are a generous selection of meat-free dishes such as butternut squash fregola, roasted salmon, passion fruit miso black cod and more. For steak, the meat here is USDA prime beef and is offered in small, medium and large servings, for cuts like fillet, flank, striploin, ribeye, t-bone and tomahawk. Plus, there’s an option for prime cuts of American, Japanese or Australian wagyu, grade seven. My dining partner and I enjoyed a 200g fillet and a 300g striploin, which were both grilled to a perfect medium-rare temperature and well-rested. On the side, the creamed spinach and mac & cheese were great accompaniments. For those with a sweet tooth, the dessert menu options include comforting dishes like cheesecake and chocolate fondant. The front of house team here is friendly and super energetic. They are well-versed on the menu and offered great dish recommendations. It’s a great venue for a lively evening with a small group of friends or family, or even for a more upbeat date night with your other half, that allows you to dress up a bit or go smart casual.